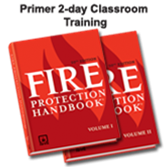 A high level of proficiency with the NFPA®'s Fire Protection Handbook® is crucial to your success on the CFPS examination. The 2-volume Handbook serves as the body of knowledge for the examination. The CFPS Primer, while not a test prep classroom training, does offer practical instruction that will help you quickly locate specific facts within the encyclopedic handbook. If you are serious about your career in fire protection, the CFPS credential serves as a distinguished mark of achievement within the profession. Earn 14 hours or 1.4 Continuing Education Units. Attendance is required to earn CEU's. Please verify applicability with your professional board or organization before attending. The CFPS examination is offered in pencil-and-paper format the day after the CFPS Primer. Pre-qualification is required to sit for the examination. For information on CFPS certification and to obtain a CFPS exam application, log onto nfpa.org/certification.